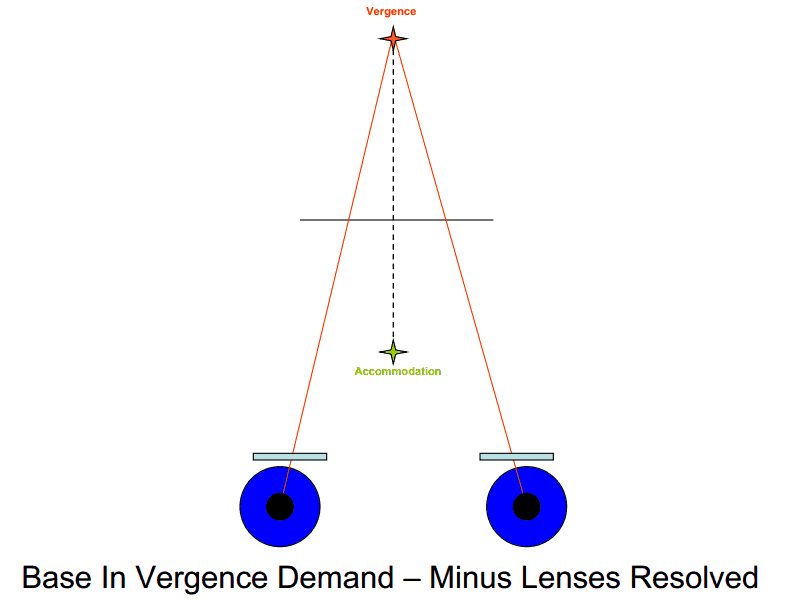 In my experiences training and mentoring newer Vision Therapists, one of the more difficult areas to grasp and fully understand is the relationship between Vergence and Accommodation. Not only the symbiosis and synchronicity between the two systems, but also the level at which we should strive to strengthen the systems both individually, and collectively, to work together and apart through the use of lenses and prismatic tools. Degrees of freedom measure the amount of separation available between vergence and accommodation within the visual system. To help illustrate this process, I’ve created a few diagrams, each with a brief explanation. All diagrams can be clicked on and enlarged for better viewing. This first diagram illustrates vision in a “normal” state of rest. If we were having our patient perform Vectograms, this illustration shows where their vision would be when we are on the zero setting. 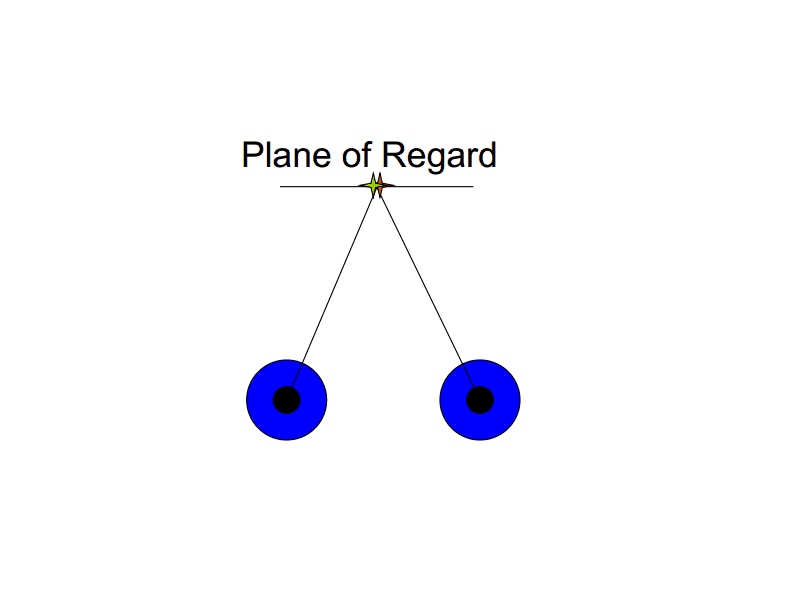 As you can see, vergence (illustrated by the orange star), and accommodation (illustrated by the green star) are both settled on or near the plane of regard (a.k.a. “the target”) as we achieve clear and single vision. 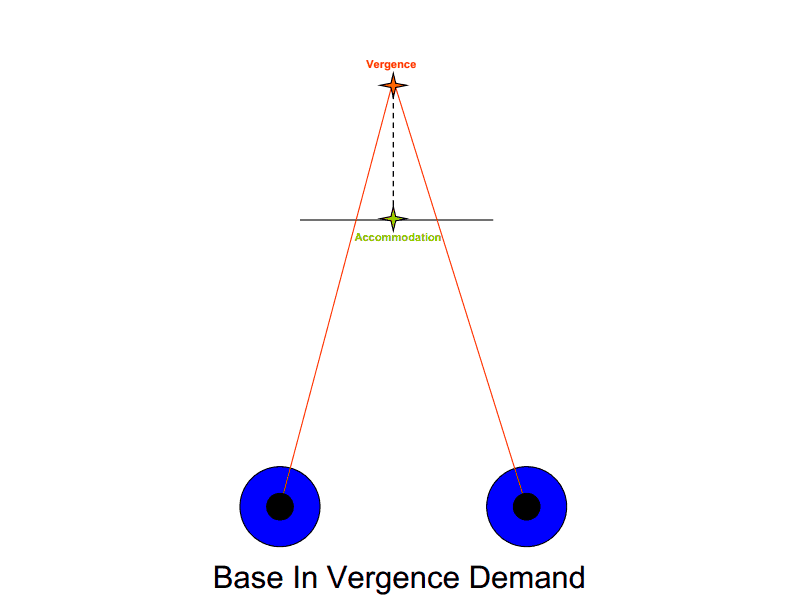 This second diagram, labeled Diagram B, illustrates vision under Base In, or divergent, conditions. As you can see, vergence (illustrated by the orange star) is behind the plane of regard (POR), and accommodation (illustrated by the green star) has settled on or near the POR to achieve clear and single vision. The dotted line illustrates the current degrees of freedom, or separation between the two systems. As the demand is increased (we move the Vectogram further into the alphabet) the point of divergence would get further from the POR. In order to maintain a clear and single image, the patient must hold accommodation on the POR. Patients who struggle in this situation may either report single and blurry because divergence is appropriate, but accommodation cannot relax back to the POR – or double and clear, which would indicate accommodation is appropriate, but vergence cannot properly align. Diagram C illustrates the results of minus lenses stimulating the accommodative system and vergence reflexively stimulated to converge, while viewing a Base In target. This is commonly referred to as BIM, or Base In Minus. Note both the green and orange stars have moved closer, in equal increments due to the stimulation, but the length of the dotted line has not yet changed. To maintain a single target, one must actively diverge, or relax vergence, while holding accommodation in the stimulated position as shown in Diagram D.
Included in Diagram D is the increased distance between the two stars and length of the dotted line. This demonstrates the separation between the fusion point of vergence (illustrated by the orange star) and the focal point of accommodation (illustrated by the green star), showing an increase in the degrees of freedom between the two systems. If, and when, the patient is able to simultaneously meet the demands of the Base In target and the minus lenses, they will achieve clear and single viewing – which should always be our goal with Vectograms. Posted on March 19, 2016, in From My Perspective.... Bookmark the permalink. 4 Comments. Hi Robert – sending greetings from Spain. By chance I am training some vision therapists and this post is very timely. I will be printing it and bringing it to our session Monday. Thanks Robert! I hand drew something similar ( sort of) when training a new therapist in our office. The graphs are much more nicely done!